I inherited a Porter Cable 690LR router and a Router Lift FX. I also have the Porter Cable 895PK set with plunge base. I want one for handheld use and the other permanently mounted in the table. I’d like to use the 895PK in the lift because of the higher HP and variable speed. The problem with that is 1) the terrible bit changing thing (that never worked) gets in the way so I can’t raise it high enough for an above the table bit change. 2) I don’t have a plunge base for the 690LR and would have to spend $100 to get one. At this point my inclination is to hack off the 895 bit changing thing with a grinder so I can do above the table bit changes. Then buy the 690LR plunge base. The only problem is this will cost money. Is there a better way to do it or a better use of $100+ to get another router for the table. I’d only need the motor itself. What “bit changing thing” gets in the way? I have a PC 895 and I use two wrenches to change bits. 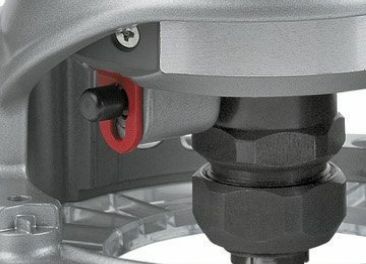 Do you have the offset wrenches that allow above-the table bit changes? If not, that might be the easy way to resolve the bit-changing issue. I don’t use a plunge router much, so, for me, when it’s time to plunge, I just remove the router from the table and slip it into the plunge base. I have a 690 that I use for most hand-held work. I suggest putting the 890 in the table and using the 690 hand-held. my table router never sees the light of day and lives in the lift. bought a Dewalt trim router for the off the table stuff. Some day ill grab another full size unit off of craigslist. What I meant to say was that I use the table most of the time but I never take the router out of the lift. Like Jerry said, the bit thing should be no issue with offset wrenches. I have been meaning to try one. Although they show the Allen wrench from the side I would think using the wrench vertically would allow easier bit changes. But as stated above, I also have multiple routers with one dedicated to my table. I’m leaning towards getting a PC 892 body to put in the lift. It’s $160, so only $60 more than getting a plunge base for the 690LR router. The bit changing thing that gets in the way is in the picture below. It stands proud of the motor body and hits the plate when you raise the router up. It just seems a shame to have a nice router lift that allows you to do above the table bit changes and have this screwy thing ruin it. I’m sure it will be easy to cut it off.